One of the most (if not the most) important illustrators of the Canon (sharing the stage with Frederic Dorr Steele), Sidney Paget was born in London, middle brother of three artists (Henry, Sidney and Walter). He started drawing at a young age and studied at the British Museum for two years before entering Heatherley's School of Art, and subsequently the Royal Academy Schools. He was a well-known illustrator and is best known for his illustration of Sherlock Holmes. Paget chose as his model his brother, Walter (actually a more famous illustrator). 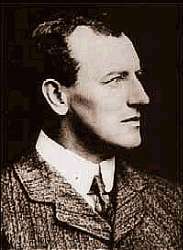 Despite Conan Doyle complaining that his creation was not nearly so handsome, most versions of Holmes - illustrated and on the screen have continued to be based on Paget's original. Interestingly, it has been noted that his brother Walter was the Paget who was to be pressed into service to illustrate the Canon for The Strand and it was, apparently, through error that Sidney got the commission. Walter did, however, illustrate one story (Dyin) after the death of his brother.